programming in J2EE. 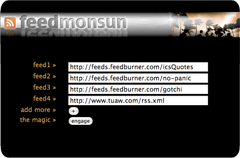 So we decided to build FeedMonsun, as we just recently discovered all the neat things you can do with RSS and because the project seemed to be doable with our level of expertise. Currently the application is still under heavy development (I refuse to call it Beta in these Web2.0 days) and only the core functionality is available at this time. Those where the features that brought us through the test and allowed us to get a decent mark for the project. There are several more fetures planned, like user registration, to get a more memorable URL and uploading/parsing of OPML files. One of the major features is still not implemented, which was one of the main pionts of the idea: republishing the aggregated feeds as a new RSS feed. I didn’t have time to work on it until now but I’m convinced that it shouldn’t be to hard to accomplish. Fell free to suggest and request new features. A special tank you goes out to Oliver who provided us with webspace and a suitable runtime environment for FeedMonsun. One of the main goals when designing the UI was ease of use. So there is no registration, set-up or anything else. Just fill in as many feed URLs as you like hit “engage” and you’re set. One issue though: at the moment you have to note your user ID which is displayed on top of the feed URLs form and append it to the applications url if you want to return to the current set and edit it in the future.